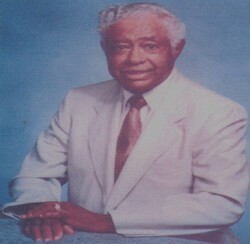 Jesse G. Ray, Sr. knew at an early age he wanted to work in funeral service. In 1932, at the age of 21, he was one of seven African Americans in a class of 47, to graduate from Worsham College of Mortuary Science, Chicago, Ill.
Mr. Ray began his career with McCoy Funeral Home on Eagle St. He lived in the YMI, which was the basis for his later interest in preserving the historic YMI building and serving as chair of the board of directors of the YMI Cultural Center. Mr. Ray entered into a partnership with Gaither Henry to form Ray & Henry Funeral Home; also on Eagle St. In 1938, with his wife, Julia G. Ray, established the Jesse Ray Funeral Home at 267 College St. They operated on College St. until purchasing 185 Biltmore Ave., the former Asheville Colored Hospital and previous residence of Dr. R. H. Bryant, an African American physician. Prior to moving to Biltmore Ave., Mr. Ray was a civilian embalmer for the U S Army, serving in Europe during WW II to prepare killed U S soldiers for return home. During Mr. Ray's absence, Flethcher Birchette worked with Mrs. Ray to operate the funeral home. Upon Mr. Ray's return, Mr. Birchette formed a partnership with W.C. Allen to establish Allen-Birchette Funeral Home on Southside Ave.
During the late 1940's and 1950's, Mr. Ray and his brother, William Howard Ray, were partner's in Ray's Cleaners,on the corner of Eagle and Velvet Streets; just below Mt. Zion Baptist Church and the Eagle Theatre. The funeral business on Biltmore Ave. grew and Mr. Ray renovated the building several times to provide accomodations for the community. Mr. Ray died in 1994 and Jesse Ray, Jr. assumed operation of the business. In 1996, the Ray family purchased the Allen Funeral Home to create Ray & Allen Funeral Service. Jesse Jr.'s son, Bryant is the Office Manager and a Funeral Service Apprentice. Although not active in the business, Mrs. Julia Ray maintains her license as a Funeral Director and will celebrate her 100th birthday on October 28, 2014.